I’ve recently sewn/photographed/blogged about two new vintage makes. Simplicity 3257 is a c. late 1950s combo skirt/trouser pattern and went together really beautifully. I highly recommend it for the skirt, though I haven’t yet tried to sew up the trousers. The skirt only used three pieces and was very true to size. I enjoyed the instructions for certain vintage craftsmanship that we don’t often use today, like the lapped zipper. I’ve been doing it the “hard” way all this time! My other creation was inspired by c. 1957 Advance 8288. It’s a “sub-teen” pattern for coordinating separates. I LOVE having options and variety, and even though it looks like a dress I can wear each piece on its own! So wonderful. I didn’t actually sew with the pattern, but rather I used the art as inspiration and Frankenstein-ed two patterns from my collection to make the blouse. The skirt is a simple dirndl style with two side pockets. Both are made with vintage metal zippers from my stash, though the rayon fabric is new (from Gertie’s collection at Joann). My friend, who sewed up this project with me, did have the pattern and noted that it was simple to make but included a lot of wearing ease. I finally got round to making the skirt and top view from Simplicity 4872, which looks to me late 50s/early 60s. 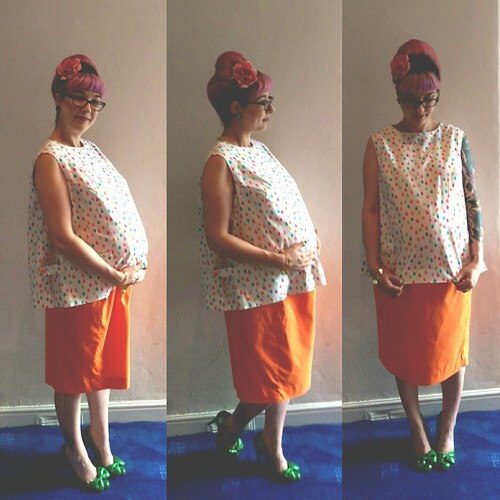 I know vintage maternity patterns aren’t everyone’s cup of tea but after extensive research online I really couldn’t find that much that had been made up for me to look at. 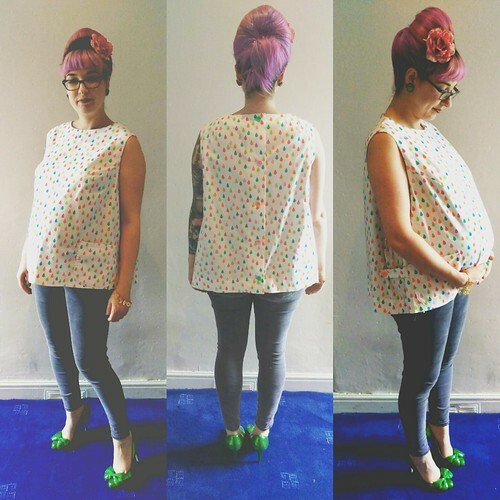 So if you’re considering making vintage maternity clothes this may be the post for you. I should really say at this point that I have never used a pattern with hole punches marking different parts of the pattern (i.e. darts etc) – is there a name for this sort of pattern? Truth is, I’ve always been a little put off and scared by them. It seems a little bit silly now I have used one, as there’s no difference really once you follow the instructions! 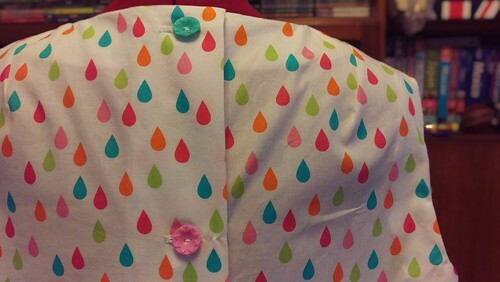 I added some vintage style buttons I had from an old issue of Mollie Makes magazine and voila, my top was complete. To say it makes me look huge is an understatement, but here it is in all its glory. Needless to say we had a good old laugh when we were taking the photos and in the end I gave up even trying to make it look good. The truth is, the skirt has to have a lot of material because it’s cotton but it does have the unfortunate effect of making me look about twice the size. Alas, all was not lost. I actually quite like the top, even if I would rather never wear the skirt. So I went and put a pair of my skinny mat jeans on and it looked quite good. In fact, I will be wearing it without a doubt. Hi all! It’s been a long time since I’ve come onto We Sew Retro to look around and contribute, it’s good to be back. 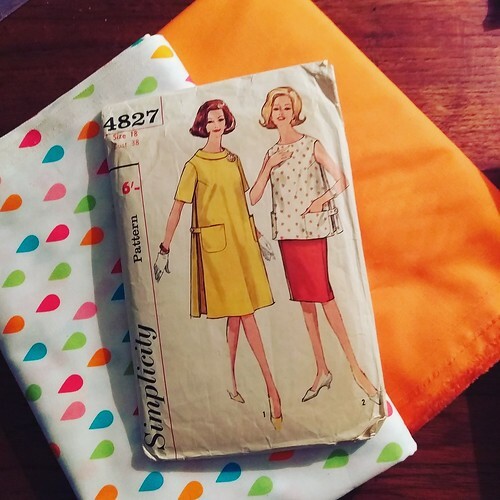 I sewed up vintage Simplicity 4130 a while back and just got around to reviewing it. All in all, it was a great pattern to work with. I converted it to use a knit fabric, but a friend of mine sewed it up in woven and it turned out just as lovely. So it’s a versatile pattern as well! My favorite part is that it’s reversible! 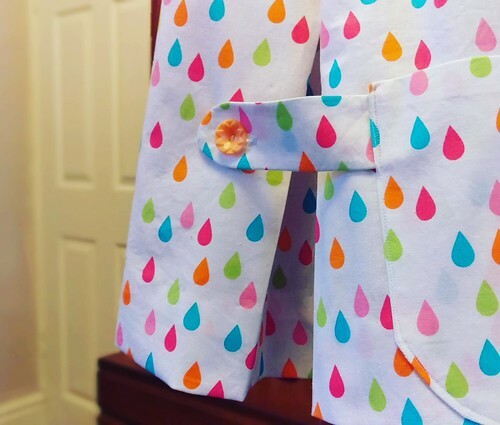 Since it’s so similar to Gertie’s new pattern Butterick B6285, I asked a blogger friend who’s used it, Christina of Gussets and Godets, for her thoughts, as it could be a convenient substitute if you can’t locate Simplicity 4130. Doesn’t Christina look cute? It’s a great match to the vintage pattern. Thoughts about working with Simplicity 4130 and more photos on the blog, thanks for stopping by! I made this blouse using vintage pattern Bestway D.3,109. It looks to be one of those mail order style patterns from the 50s. I can’t see a date so I’m going by hair and shoes on the cover image! It’s a wrap-over top, held closed with two vintage buttons. The third button is for decorative and balancing purposes! The bottom two buttons sit just above the waistline at the base of the two waist darts. It could really do with a fourth hidden button to keep the under wrap layer in place. But for now, I’m tucking it in my pants! The back is cut in one piece with extended sleeves and the front yokes form the sleeve fronts. I love the shape of the neckline and how the collar just lays flat across the collar bone. I’ve not seen this style on any other garment to date. And as most 1950s patterns go, I love how it’s nipped in at the waist for that flattering silhouette. When I came to choose the fabric, I knew I needed a crisp, 100% cotton fabric but I didn’t bank on finding a lighthouse print! I think it worked perfectly to achieve the whole vintage repro style! For more vintage and modern hand-makes, please pop over to ooobop! Another 1930s re-pro pattern from EvaDress, I made these up a few months ago but finally got around to documenting them. I had started the blouse (not enough of the lovely rayon for a whole dress) ages ago, but the sleeve pleats got the better of me and then I got busy with other things. Once I’d figured them out though, I’m in love with the look. As I had an occasion to wear it, I finished the blouse and made up the lower portion of the pattern in a similar green coloured mystery fabric I picked up second hand. EvaDress 1934 Frock (as separates) by HLB. Back view. Cutting out the blouse and getting it to do what i wanted was a bit of a challenge. It’s a buttery rayon with lovely drape but frays terribly at the edges and slinks around when you try to sew it. I pinned it to within an inch of its life and took the time to hand baste as well as hand hem the bottom edge/ties, collar and sleeve edges. Time consuming but a nice neat finish. Sleeve detail. Self covered button and pleating. Most people thought it was a dress when worn together, but I actually like that I can mix and match it. For another event I made a shorter black rayon skirt with side godets for dancing in. I’ll definitely be making this up again with some strategic alterations. As always, do check out the full post on the blog. And my first 40’s sewing !!! So I have a challenge, make a sailor outfit with patterns from XXI era….